Shipments of the Tatuaje TAA 2012 have begun arriving at selected retailers. This marks the second year that Tatuaje has been selected to release a special cigar for Tobacconist Association of America retailers. 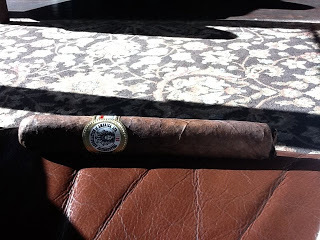 For 2012, the blend is very similar to the Tatuaje TAA 2011 in that it uses a Connecticut Broadleaf wrapper over Nicaraguan binder and filler. The difference is in the size as the TAA 2012 is longer and has a thinner ring gauge – measuring 6 1/4 x 50 (compared to the 5 5/8 x 54 TAA 2011). The banding is similar between the two except for the fact that the TAA 2012 references the year 2012 instead of 2011. Cigars that are selected as releases for the TAA are only sold at those retail stores that are TAA members. The estimated production is around 1500 boxes of 20. As mentioned above, the Tatauje TAA 2012 has a similar blend profile to the Tatuaje TAA 2011. Like the Tatauje TAA 2011, the Tatuaje TAA 2012 is available in only one size. For 2012 it is a 6 1/4 x 50 more traditional toro. Like 2011, the 2012 also features a closed foot.